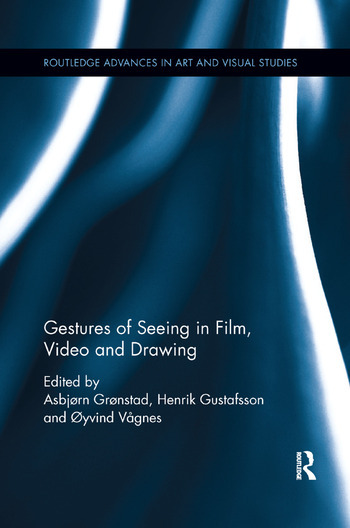 The first book of its kind, Gestures of Seeing in Film, Video and Drawing engages broadly with the often too neglected yet significant questions of gesture in visual culture. In our turbulent mediasphere where images – as lenses bearing on their own circumstances – are constantly mobilized to enact symbolic forms of warfare and where they get entangled in all kinds of cultural conflicts and controversies, a turn to the gestural life of images seems to promise a particularly pertinent avenue of intellectual inquiry. The complex gestures of the artwork remain an under-explored theoretical topos in contemporary visual culture studies. In visual art, the gestural appears to be that which intervenes between form and content, materiality and meaning. But as a conceptual force it also impinges upon the very process of seeing itself. As a critical and heuristic trope, the gestural galvanizes many of the most pertinent areas of inquiry in contemporary debates and scholarship in visual culture and related disciplines: ethics (images and their values and affects), aesthetics (from visual essentialism to transesthetics and synesthesia), ecology (iconoclastic gestures and spaces of conflict), and epistemology (questions of the archive, memory and documentation). Offering fresh perspectives on many of these areas,　Gestures of Seeing in Film, Video and Drawing will be intensely awaited by readers from and across several disciplines, such as anthropology, linguistics, performance, theater, film and visual studies. Asbjørn Grønstad is professor of visual culture in the Department of Information Science and Media Studies, University of Bergen. He is founding director of Nomadikon: The Bergen Center for Visual Culture and author/editor of several books in film studies and visual culture. He is also founding editor of the peer-reviewed journal Ekphrasis: Nordic Journal of Visual Culture. His most recent book is Cinema and Agamben: Ethics, Biopolitics and the Moving Image (co-edited with Henrik Gustafsson, 2014). Henrik Gustafsson is Associate Professor of Media- and Documentation Science at the University of Tromsø, Norway. Recent publications include Cinema & Agamben: Ethics, Biopolitics and the Moving Image (2014) and Ethics and Images of Pain (2012), both co-edited with Grønstad, and articles in History of Photography (February 2016) and Journal of Visual Culture (April 2013). Øyvind Vågnes is Associate Professor of Visual Culture at the University of Bergen, Norway. Recent publications include "Lessons from the Life of an Image: Malcolm Browne's Photograph of Thich Quang Duc's Self-Immolation", in Frances Guerin, ed., On Not Looking: The Paradox of Contemporary Visual Culture (London: Routledge, 2015), and Zaprudered: The Kennedy Assassination Film in Visual Culture (2011), which received honorable mention at the American Publishers Awards for Professional and Scholarly Excellence.